Welcome and support the citizens of Ste-Martine and St-Urbain Premier via activities and community services. Youth protection services. Family interventions. Information and employment services. Last resort financial assistance (social solidarity program and social assistance program. Parents with newborns of young children can turn to the CLSC for information and advice about pregnancy, infant care, nutrition, dental hygiene, general health, vaccination, education, child behaviour and family life. Expecting parents can also benefit from pre-natal classes and the OLO program (milk, egg, orange and prenatal vitamins). Asthma clinics. STD clinics, Youth clinics are available. Nursing clinics with appointment and Family Medicine Clinics with appointment. Family or individual consultations with or without appointment are available for people in needs. Public health and community development. Home care services. Thrift store (clothing, furniture, appliances, household items, etc.). Sell goods at low cost. Emergency and supplementary assistance for people in basic needs. Violence prevention program for children. Workshops offered for preschool and elementary schools. Work to break the circle of isolation for people with low income. Community meals, collective kitchens and food buying collective. Provides free transportation in Châteauguay. Homework support program and community outreach and education programs. Provides emergency shelter, housing, counselling and support to abused women and their children. Transitional outreach and community awareness program. Women's centre that provides services and support primarly to single mothers, women in blended families or women in the process of separation. Services include information and referral, individual counselling, respite program, parent education and support group (Mothers-teens program, Samedi de m'en sortir) and Mothers-friends program for parents of 0 to 5 years old children. Support programs for families with children aged between 0 and 5. 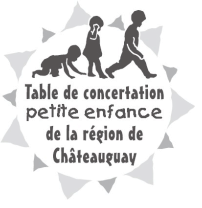 Activities for parents and children in Châteauguay and Sainte-Martine. Workshops on discipline, group discussions, outing and daycare services.